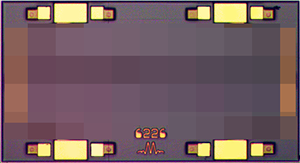 The MQH-3R510 is a MMIC 3.5 GHz – 10 GHz quadrature (90°) hybrid. Wire bondable 50Ω terminations are available on-chip. Passive GaAs MMIC technology allows production of smaller constructions that replace larger form factor circuit board constructions. Tight fabrication tolerances allow for less unit to unit variation than traditional quadrature hybrid technologies. The MQH-3R510 is available as a wire bondable chip or connectorized module. Low variation allows for accurate simulations using the provided S4P file taken from measured production unit. Applications include single sideband upconverters, image rejection downconverters, IQ modulators, balanced amplifiers, microwave correlators, and microwave Butler matrices. Min and Max limits are guaranteed at TA=+25°C.